The Economy Body Bag by Lightning Powder is more than what you'd expect: This is a high-quality, waterproof bag made with heavy-duty materials that will hold up to 200 pounds. 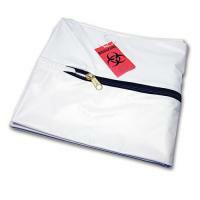 It is constructed with white, durable 7-mil plastic and completely waterproof, even at the seams. Likewise, the sturdy, centered zipper is made of plastic so it will not interfere with X-rays. Each bag measures 93 in. (width) x 36 in. (length) (or 2.36 x 0.91 meters), with a girth of 60 in. (1.52 m). Centered, heavy-duty plastic zipper (does not interfere with X-rays). Measures 2.36 m (length) x 0.91 m (width) (93 x 36 inches) when unfolded. Girth measures 60 in. (1.52 m).